Projects involve a lot of work items (cards), which in most of the cases are located on different Kanban boards (strategic; management; team). If there is no proper setup between them, the overall visibility is quickly lost. 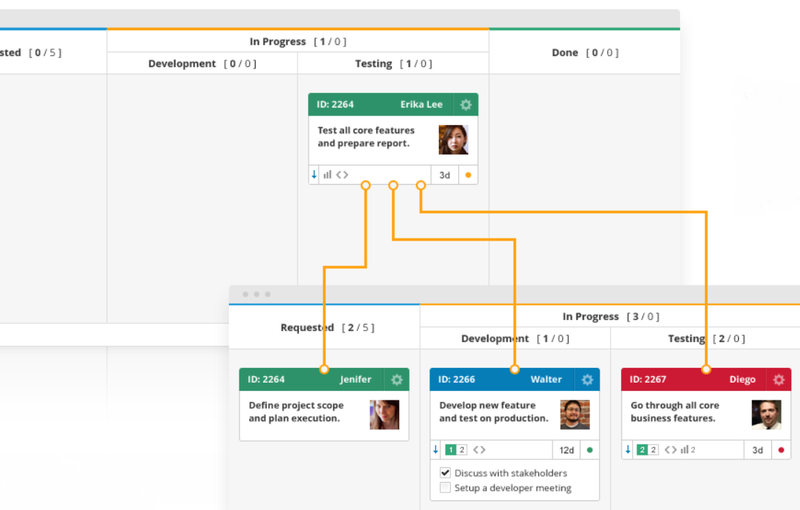 Linking Kanban cards on different boards helps you to get a better visibility and never lose track of your work. All the links that you create are visible directly on the card and users can quickly get access to the linked cards. The card linking capability is an instrument that plays a major role in the implementation of the Portfolio Kanban Management scenario. The cards relations in Kanbanize are defined at a task level and there are several different relationships that you can choose to apply between your cards to create links (img. 1). - Users can link cards that already exist. - Users can use an existing card to create new cards and instantly link them with the selected type of relation. With the child/parent relationship between cards, you can slice a big work item or even an entire project into smaller items. This type of relationship enables you to break down a task (parent card) into smaller pieces of work (child cards) and track each child card separately. If multiple cards belong to the same group of work items, but there is no hierarchy between them you can link these cards with the relative link to group them together. This relationship creates rules of order in the breakdown of your work via dependencies between the cards. If this connection is established, the system allows you to start working on the successor card, if its predecessor card is in the Backlog or Requested sections. The successor cannot be finished if its predecessor is in the "In progress" section. 3. How to link cards in the system? To learn how to create links between cards and how to break down a card, please read the dedicated article "How to Link and Create a Breakdown of a Card?". With Kanbanize, you can not only link cards but also synchronizing some properties between the linked cards. Important: You can use the same capability when working with Initiatives. 4. How do linked cards get visualized? - All links (if present) are displayed in the Links Overview menu (the bottom right side of the card). - To make the linked cards visible at the closed card view (Image 2)-> go to the sidebar to the right of your board interface -> select Configure Card View -> checkmark " Show links" (one per row). On hover, you will see details about each linked card from the parent card itself. 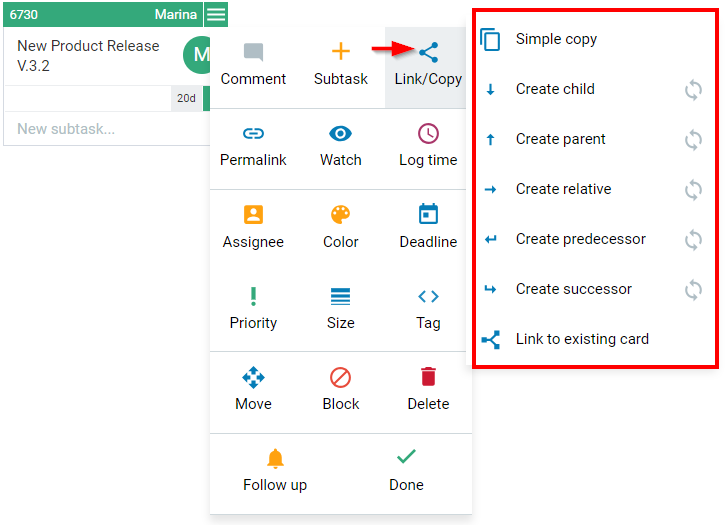 - The Arrow icons beside the card titles of the linked cards show whether a task is a parent of other tasks (arrow points up) or a child of another task (arrow points down). An arrow pointing right represents a relative. The curved arrows are used to visualize successor and predecessor card relation. - The Colour code stand for the position of the linked cards on the Board. The grey color corresponds to the "Backlog". The blue color corresponds to the "Requested" stage. The orange color corresponds to the "In Progress" stage. The green color corresponds to the "Done" stage. The purple color corresponds to the "Archive". Tip: The color codes are very helpful when you want to get an idea about the number of incompleted cards.